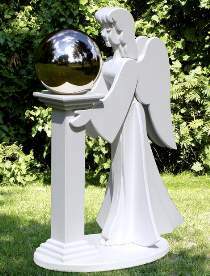 This elegant yard sculpture symbolizes an angel's watchful gaze over the world. The 40"H angel is made from 3/4" and 1-1/2" stock. Project accommodates a standard 10" gazing ball. All patterns drawn FULL SIZE.